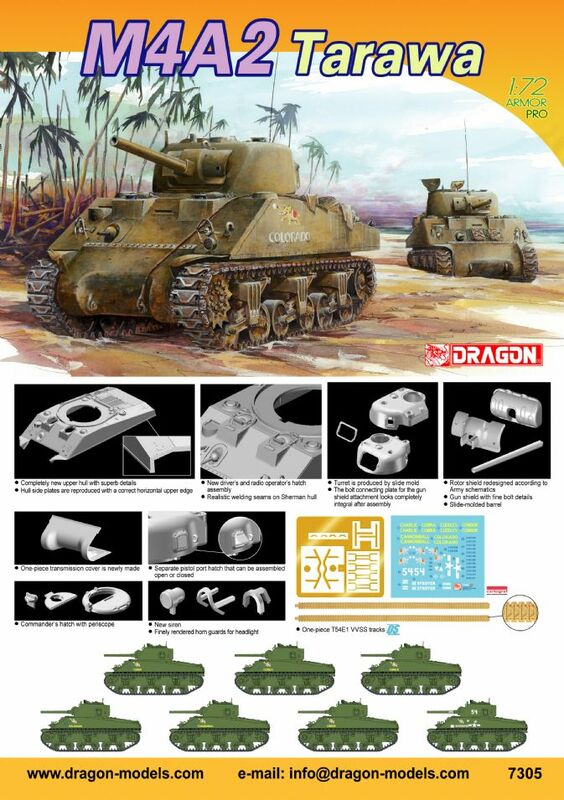 The Sherman was the most famous American tank of WWII, and Dragon has introduced an M4A2 variant in its 1/72 scale range of kits. The original 31,800kg M4A2 is interesting in that it was the only diesel engine version of the Sherman to see widespread service, mostly with Soviet (as Land Lease equipment), British, Free French and U.S. Marine Corps forces. Because of its diesel engine, the M4A2 had a completely different engine deck and rear hull plate from those of other variants. This M4A2 from Dragon reflects those variants fitted with a 75mm gun used by the USMC in the Pacific Theater of Operations (PTO). The kit features a completely redesigned turret and upper hull, along with many other new parts. The turret is produced by slide molds in order to allow the form and features to be accurately reproduced. Before now, manufacturers have incorrectly portrayed weld beads on the Sherman as being recessed, but Dragon has addressed this serious discrepancy and here offers correct raised weld beads. As with previous Sherman kits, detail on this one is excellent and accurately rendered, and to add further convenience, it comes with DS tracks. With this magnificent M4A2 rendition from Dragon, modelers will be able to recreate scenes from any of the horrendously bloody battles on the islands of the Pacific more than 60 years ago.